Commercial Carpet Cleaning | All Building Cleaning Corp. Commercial Carpet Cleaning | All Building Cleaning Corp.
First impressions count when it comes to the cleanliness of your building so you want the best carpet cleaning solution. If customers or prospective employees walk into your office and see dirty carpet, it creates a negative impression of your business. In order to keep up the appearance of your building and keep your carpet from becoming damaged prematurely, we recommend you clean the carpet at least once per year; sometimes more, depending on traffic. At All Building Cleaners we take certified courses through IICRC (Institute of Inspection, Cleaning and Restoration Certification), and continue to train our carpet cleaning technicians with on the job-hands on and DVD training as well as seminars, which means you can rest assured your carpet is in good hands. As part of our cleaning proposal, we will make recommendations on the frequency and type of carpet cleaning your carpet should receive. Hot water extraction carpet cleaning is recommended. Other types of carpet cleaning (like dry chemical cleaning) may void the warranty. For most office buildings we recommend hot water extraction carpet cleaning once per year. Hot Water Extraction is commonly known as steam cleaning and it is a method used in chemistry for extraction and pressurized hot water extraction. It is a process uses a combination of high water pressure for agitation, and hot water to increase reaction rate. Bonnet carpet cleaning is interim cleaning, which will keep your carpets looking fresh and clean throughout the year. Bonnet cleaning is a minimum moisture carpet cleaning method. Bonnet cleaning essentially consists of cotton, rayon and/or polypropylene pad and a rotary shampoo machine. It is among the easiest carpet cleaning methods to learn. Primarily there are three procedures for using the bonnet method. The first procedure involves spraying a detergent solution onto the carpet. The second procedure used in the bonnet method involves the use of a rotary shampoo machine and a moistened rayon, cotton, and/or polypropylene pad. This pad is attached to the rotary machine. The rotating pad is used to agitate and aid in suspension of soils. 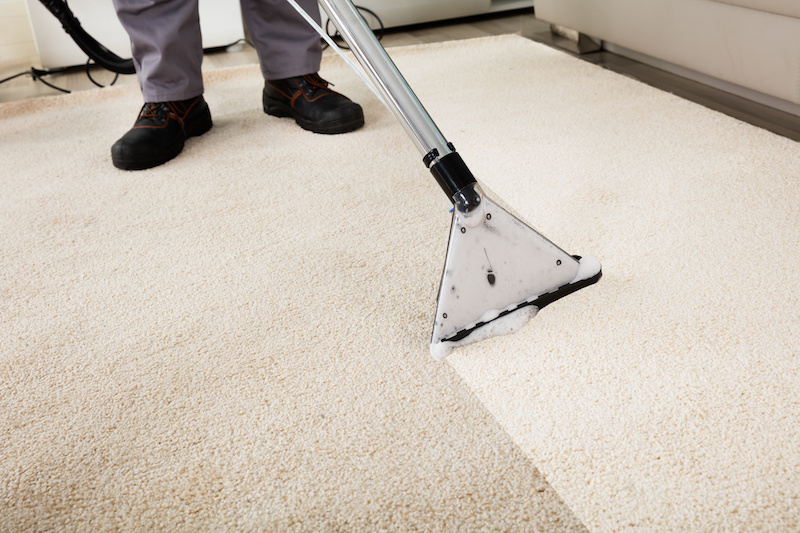 The third is to thoroughly vacuum the carpet once it is dry, removing any remaining soils. We usually recommend bonnet carpet cleaning of traffic lanes six months after hot water extraction. Encapsulation carpet cleaning is another type of interim cleaning, which we may recommend depending on your situation. Encapsulation carpet cleaning is essentially dry carpet cleaning and entails the use if specialized machines. Recently developed chemical technologies permit no-moisture or very low moisture cleaning, resulting in carpet beautification, and removal of stains, dirt, grit, sand, and allergens. Clean carpets are recognized as being more visually pleasing, potentially longer lasting and healthier than poorly maintained carpets.